When wildebeests migrate between Kenya and Tanzania, zebras join them in the tens of thousands, and even when wildebeests quietly graze (and unwittingly pose for our photos), zebras are often among them, making for a quite satisfying game viewing experience. Zebras often graze alongside wildebeests. These animals are on the Maasai Mara. However, the two species are very distinct. The zebra looks like a horse but has a back too weak to be a beast of burden, and it barks like a dog. The wildebeest doesn’t look like many other animals, save the hartebeest, and the dominant male — seeking to keep his harem intact — makes a sound that I compare to belches crossed with bovine-like eruptions. 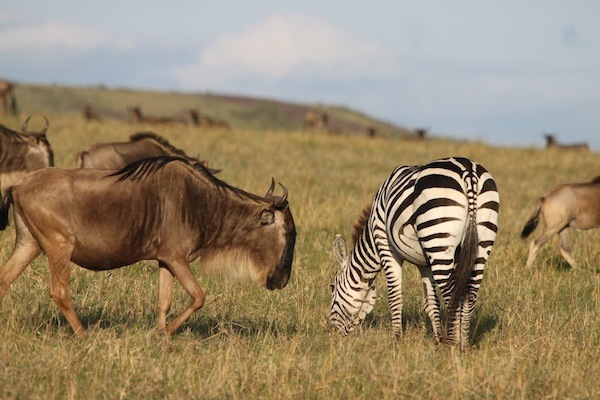 Guides are fond of saying the wildebeest was created from whatever was left over after other animals were assembled. Wildebeests are antelopes, putting them in a class with an abundance of well-designed creatures, ranging from the elegant eland to the spritely Thomson’s gazelle, aka, the Tommie. 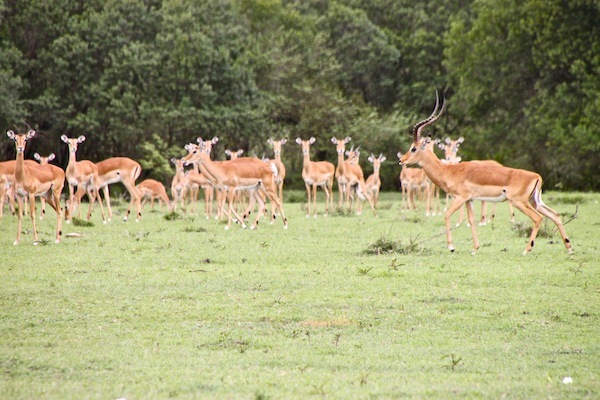 From my notes, I calculate I photographed 12 antelope species during about five days of Kenyan game viewing. 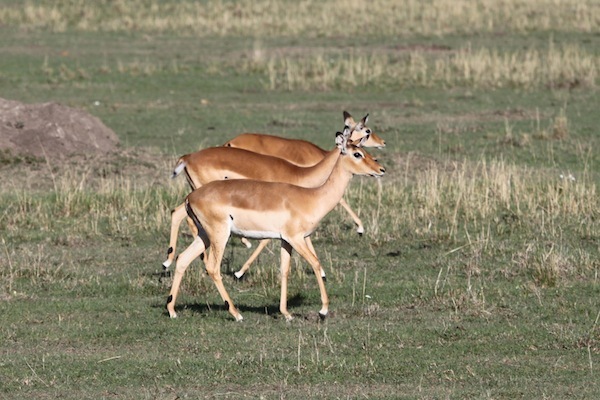 A trio of impalas prances across the Maasai Mara like showgirls. From here on, I will mostly let my photos do the talking. 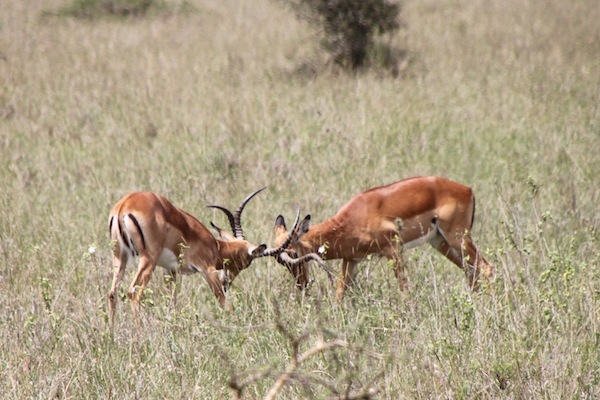 I have male Tommies in head-to-head combat, and a pair of impala males going at it, too. Male impalas go head to head in the Nairobi National Park, our group’s last stop, just hours before heading to the Nairobi airport for our flight home. On a different day, we eyed a large impala harem — the females frozen in place, whether because we were near or because the pacing male was even nearer, I don’t know. I have the delicate dik-dik, one of the smallest antelopes (up to 16 inches tall, up to 11 pounds). We saw dik-diks on the Maasai Mara, but some had managed to get inside our fenced camp (near Amboseli National Park, our destination after the Maasai Mara). One dik-dik was munching on greens just outside my tent. 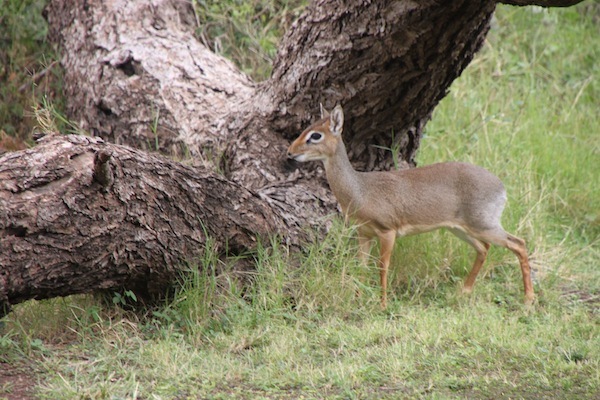 A lone dik-dik seen on the grounds of a tented camp near Amboseli National Park. The grounds are fenced, which may provide some protection from predators for the tiny antelope. The topi, with markings that look tailored, were both sensible (I presume) and amusing when they perched themselves on tiny bumps in the terrain to survey the landscape. 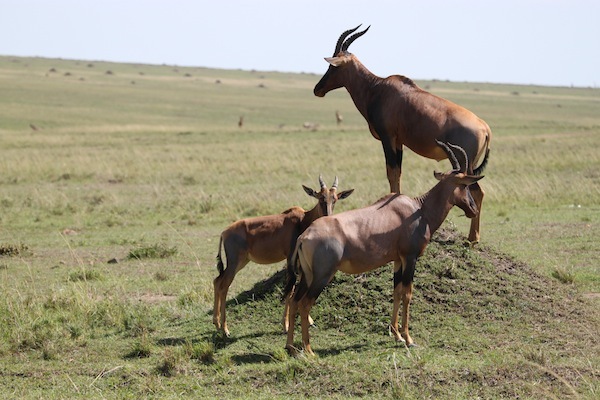 Three topi on or near the lookout point provided by a tiny knoll in the Maasai Mara. The youngest is focused on the four-wheel-drive vehicle that carries human interlopers. Others of the antelope species simply looked grand, and that was enough. 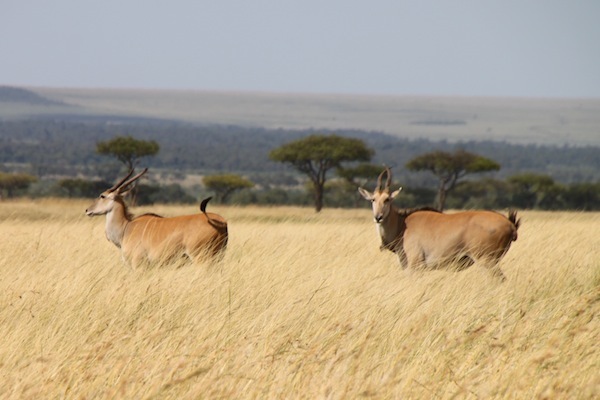 Two elands look grand without even trying, seen on the Maasai Mara.